Disclaimer: I was invited to attend this event and all expenses were paid my Disney. Interviewing Tom Hiddleston was one of the most memorable experiences I have had! He is the most charming, entertaining, and outgoing actor I had had the opportunity to meet. I also interviewed him for Avengers last year when I was in New York and he definitely had me at “..hello”. Tom Hiddleston plays the villain that is EASY to fall in love with. You fall in love with his character because you see and hear the motivation he has and know why he acts as mischievous as he does in the Marvel movies. 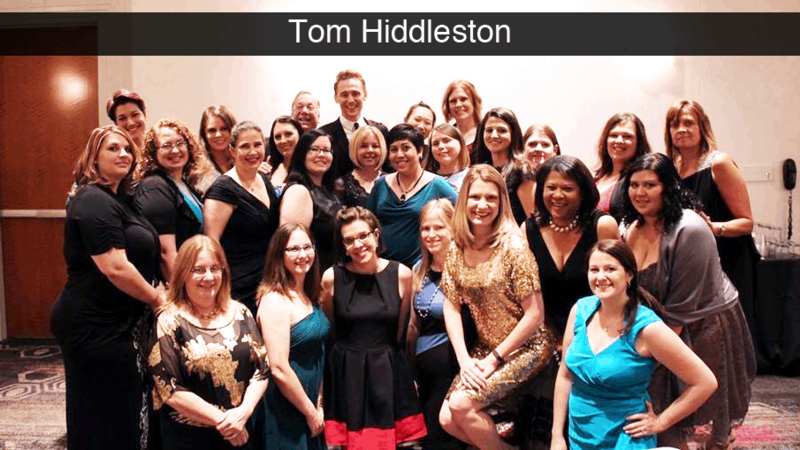 He has more fan girls than Thor! He called all of us beautiful! What a gentlemen! He is an amazing actor so I would like to believe he wasn’t “acting” when he called us beautiful ;). I definitely took it as a compliment! He is nothing like Loki in real life. He is handsome and clean cut! You almost have to give credit to the makeup artists and costume designer of the movie because you are surprised with how incredibly good looking he is in person! His accent. Yes…I LOVE listening to accents and his English accent is amazing! He actually did some awesome impressions for us during the interview! I have to add this one to my list since it will be hard to know how well he did when reading the interview below! Just believe me he did awesome and there are some from previous interviews floating around the internet! TOM : Hello. I feel like I’m a president or something [CROWD LAUGHS], which I really am not…I feel like I should be sitting here with a white cat and stroking it, “For my next question.” Okay, hi. Q : How did you get in character to play a bad guy, and do you really like playing those kind of roles? TOM : Second question first, I love playing all kinds of roles. I hope it doesn’t sound too pretentious but I always feel like…human nature is like a piano and there are 88 keys and there are some white keys and some black keys and each character is a different chord on the piano. And I love, basically I hope that in the course of my life I will have played all 88 keys in lots of different ways. So I’ll have played heroes, and villains, and princes and kings and warriors and beggars and thieves and lovers and, um, fathers and wizards and all of those things. For me that’s why I’m an actor, is I love studying people. Loki’s just a particular kind of, actually I think he’s a minor chord with a couple of black notes in there. And, I loved playing him. I suppose the first question, my answer to it is, he’s the God of Mischief. 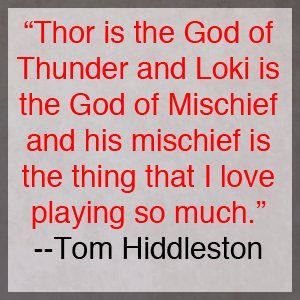 Thor is the God of Thunder and Loki is the God of Mischief and his mischief is the thing that I love playing so much. His playfulness, his sense of fun, and the challenge of course is to make him real, and vulnerable and complex. Great question. Q : How has Loki changed since we last saw him, has he reconciled with his dad? He’s basically been written out of history, condemned to be forgotten, unseen and unheard and haunted by his demons for eternity. Um, and I think he’s keeping himself sharp by reading a lot and keeping his mind exercised. But…he’s not great at the long game, Loki, but he’s very good at improvising. So he’ll always manipulate every situation to his own self-advantage, to his own advantage. I suppose, how has he changed? I think he’s almost freer in one sense, spiritually. He’s more mischievous; he’s more fun, and he’s more provocative. But he’s also more damaged. There’s a kind of spiritual, vulnerability, which is really acute. I think he hits rock bottom in this film, he’s more alone, he’s more lonely, more sad, angrier. I’m, sorry I don’t want to reveal too much. Q : Playing off of that, in one of the trailers you say, “…we can work together but begrudgingly so…” Is there a bit of an “agree to disagree” between the two? I mean obviously there’s tension. TOM : There is the fascinating thing…the reason they need to get together is one that you’ll see very clearly. And it’s despite their antagonism, which is consistent with Avengers…and in fact is even more…pushed to polar opposites, they are unified by a common bond, which is why they need to fight back. I don’t want to reveal too much but there is a big reason. What’s interesting and what’s wonderful about this particular film is the need to come together and work as a team. Actually gave Chris Hemsworth and myself amazing opportunities to explore that particular tension between them, that they were two brothers who were brought up as equals and best friends. And they loved each other and they fought and they played and they competed and they were rivals, but ultimately they were best friends. And then the circumstances of their adult lives have pushed them to absolute extremes. The difference is that where in the first film and in Avengers, Thor is consistently appealing to Loki to say, “Come back,” you know, “We still love you, come back into the family” and Loki is rejecting that olive branch. In this film Thor makes no bones about there’s no olive branch, it’s like, “I need you, and if you betray me I will kill you.” [CROWD LAUGHS][TH SMILES] And, uh, [LAUGHS]…No doubt he’s serious. [LAUGHS] Yeah, but that gives Loki something to work with in a way, um, and, uh, again I’ve always found myself, I’m straying into territory of ruining the film for you but you’re about to find out, [SMILES] which is great. Yeah. Sorry you had a question. Q : You’d said earlier you liked the mischief part of the character. When you walk into a franchise like Avengers and Thor, the fans are really dedicated, did you have any leeway with what’s going on more with that mischief part that you liked that maybe wasn’t exactly written into the script initially? TOM : It’s been an interesting evolution because I felt as though it’s been something you can’t run before you walk…So Loki is the second son, the younger brother who finds out that the narrative of his life is a lie, that he was adopted, that he was betrayed, that he was left on a frozen rock to die. And that breaks his heart. He was also a very intelligent sort fantastic strategist who was a master of magic. And then we got into Avengers and–– and Joss Whedon really encouraged me to have a good time, you know, to like he was suddenly there was this self-acceptance of his true nature and that that gave him a confidence to play. And I enjoyed all of that so much in Avengers that I spoke to to Kevin Feige, president of Marvel Studios and to Aaron Taylor, the director, saying, “We’ve got to have fun with it,” you know, he’s, of all of the pantheon of the Norse Gods most people are quite predictable, you know. Thor is the God of Thunder. And Thunder is powerful and–– and strong and he’s noble and upstanding and he’s a prince. And you sort of go through the gods. Loki is the, if–– if there were a pack of fireworks, Loki is the firework on the end. You’re not quite sure what it’s gonna do. He’s the wild card. You know, if you light the fuse it, the firework will go up and around and spin around you and explode in a ball of multicolored fire. And that is spiritually who Loki is. Playing on that unpredictability and his playfulness has really fun. TOM : Thank you. Yay!! [LAUGHS] Those pesky Avengers. Q : …I really wanted you to, right, are we gonna feel that again in this movie too or…? TOM : It’s given me so much pleasure to hear you say that, because when I was a kid, I’d watch the bad guys the ones I loved were the ones who you sort of wanted to win, You could at least understand their motivations. I hope you’ll see is that he’s still vulnerable and that all of his inclination to provoke chaos and… start fires and create conflict and enjoy all of that stuff, his delight in disorder, is a mask of control. Q : Someone from twitter wanted me to ask…If someone visits your home and looked inside the refrigerator, what would they find? Q : So there’s nothing growing in there. TOM : …I hope not, yeah. There’s probably some bottles of fizzy water [LAUGHS] and, maybe some old cheese in the back, but cheese is alright I think. But normally it’s full of green vegetables and butter, [CROWD LAUGHS] and a few eggs, [LAUGHS] you know just sort of fridgey stuff, really. [CROWD LAUGHS] Um, yeah. [LAUGHS] Yes. Q : In Marvel’s Avengers they team up a lot of superheroes and I was wondering if Loki teamed up with one of Marvel’s villains, who would it be and why? TOM : How are things, oh––if there was like a team of villains. Well the thing about getting a group of villains together is like [CROWD LAUGHS] not, they don’t get anything done. [LAUGHS] Because they’re all acting out of self-interest. [IN VILLANOUS VOICE] “No, I want to take over the world! !” “No, but it’s mine! !” “No, but it,” and then it’s over, it’s finished. And then [CROWD LAUGHS], um, but, uh, [LAUGHS] end of the film, it lasted two minutes. Um, uh, who would Loki turn up with? I’d love to see in the comics he teams up with the Enchantress, who is a sort of big beautiful blonde who is as untrustworthy and as skilled in the powers of magic as he is. And they have…quite an interesting dance that they do of recognizing that they’re basically the same, but that that’s why they shouldn’t be together. Who else? I mean I love the bad guys, I love, I’d love to see him with Dr. Doom, um, who was one of Spiderman’s big villains– there’s a villain called, Surtur, S-U-R-T-U-R, and he’s the fire demon who is, um, [LAUGHS] who’s a pretty crazy cat, you know I think that would be an interesting alliance. But I feel like if Loki ever teams up he’s just using people, you know. In Avengers he teamed up with Phanos, so Phanos who’s the big guy you see at the end of the credits, that–– that deal they made was that the Tesseract, the blue cube that Loki could use it to take over the Earth and once he had the Earth in his clutches he would hand over the Tesseract to Phanos who would then do whatever he wanted to with the Universe. So the stakes are pretty high. The good thing about Loki he is genuinely dancing on this high wire tightrope between [POUNDS TABLE WITH FINGER] good and evil, between redemption and damnation, so you never know what he’s gonna do next. 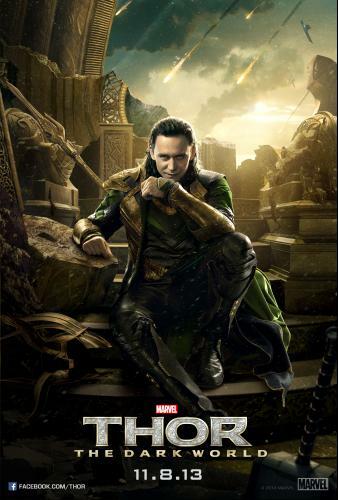 Q : A lot of people are wondering is there is going to be a Loki spinoff movie? TOM : Well, [SMILES] um, [CROWD LAUGHS] at this point in time, officially I know nothing. TOM : [LAUGHS] You won’t tell? Okay. Sea of computers. [CROWD LAUGHS] Sea of dictaphones recording my every word. Um, honestly the people have asked me about it and the idea that–– that anyone, whether it’s one man and his dog wants to see Loki in a solo movie is such a huge compliment. I hear it’s more than one man and his dog, [CROWD LAUGHS] but we’ll have to see. I honestly don’t know what the future of Loki is at this point, but it has been a rollercoaster and it’s been more than I have ever expected. Q : Not giving too much away, what was your favorite part of the film? TOM : Working with Chris Hemsworth. There are a couple of scenes where I feel like the two brothers…you just really get a sense of the particular chemistry of these two guys. I also know that my friendship with Chris is something that infused that relationship, because he and I, we met in 2009, we were both in our late ’20s, we’d been kicking around the business for the same amount of time. And, um, we became very firm and fast friends. And we’ve had this amazing adventure together. And I think our friendship really infuses the Thor/Loki relationship in this film and that’s probably my greatest pride. There’s a sort of a scene where they’re arguing over who gets to drive, which [LAUGHS] I feel is, uh, one of my favorites. Q : I’m a New York-based blogger, I read that you surprised kids at the screening, so how did you get involved with the charities to surprise them? It’s such a great thing, they were so excited to see you. TOM : I did, yeah. Well it was so thrilling for me, I knew I was coming here this weekend, what day is it Monday, [CROWD LAUGHS] and it seemed like nothing to stop off in New York and introduce that. So, you know, I’ve done some work with UNICEF and I believe very passionately and in the work that charities like Variety and The Children’s Aide Society do for children as well. I heard they were doing it so it was, it really cost nothing to just hop over and surprise them, especially with Halloween as well and they were all wearing Free Loki t-shirts and [CROWD LAUGHS] they all had like Thor helmets and hammers and I sort of got like cheered and booed at the same time, ’cause I was the bad guy, and it was great. Q : How long as it been since you’ve been interested in the comic books ’cause it seems like you know quite a bit about villains and the heroes and stuff like that? TOM : Well, it’s funny, it’s like I know, I sort of know a lot but on quite a superficial level as, I guess. Um, one of my favorite things as a kid was, there’s a game in England called “Top Trumps,” and you can have them, they’re basically, they come in different categories so you could have them for racing cars, or motocross bikes, or fighter jets and basically they’re all these things listed with their vital statistics. And you split the deck and [CLAPS] you pick. Let’s say if you have a fighter jet you’d pick, “speed” and you’d steal a guy who’d had “speed” and if you had greater speed you’d win. And it’s a really simple game. Anyway, [CLAPS] I had “Top Trumps” for Marvel’s Superheroes and Supervillains. So I didn’t read comics but I knew the vital statistics [LAUGHS] of every superhero and supervillain and that’s how I got to know them. Because it’s funny like, you know, Spiderman can beat The Hulk if you read out agility, but if you read out weight, The Hulk could beat Spiderman…So like Loki can beat Dr. Doom because if you read out intelligence, he’s more intelligent than Dr. Doom. TOM : I don’t remember if that’s exactly accurate, [CROWD LAUGHS] but you know what I’m saying. Um, and so that’s how I got to know all the characters. And I guess they were in my, they were swelling around in my consciousness, um, and of course since being cast in 2009 I know the Thor world very well now. And your question was…? Q : This is from a reader who has an Avengers Club in her school. Q : And she wanted to know if you’d get a chance to play a villain again, will you bring back some of Loki to that character? TOM : Ooh, um, I think if I play a villain again I’d have to be very specific to his particular brand of villainy. I think it’s, that’s what I see as my job is to be really rigorous to that character’s truth. And so Loki’s truth is playful and mischievous and vulnerable and damaged, but another bad guy might be kind of, I don’t know, chaotic or, um, or–– or cold in some way like, uh, I don’t know, it’s a really good question. I suppose there’s only so much range one man [LAUGHS] has, you know, if I look out from under my eyelids there’s only one way I do that. [CROWD LAUGHS] Um, who knows. Q : Playing Loki’s like playing Captain Hook. Q : I was wanting to hear one of your impressions. TOM : Do you know, which impressions do you want to hear? Q : You pick somebody. 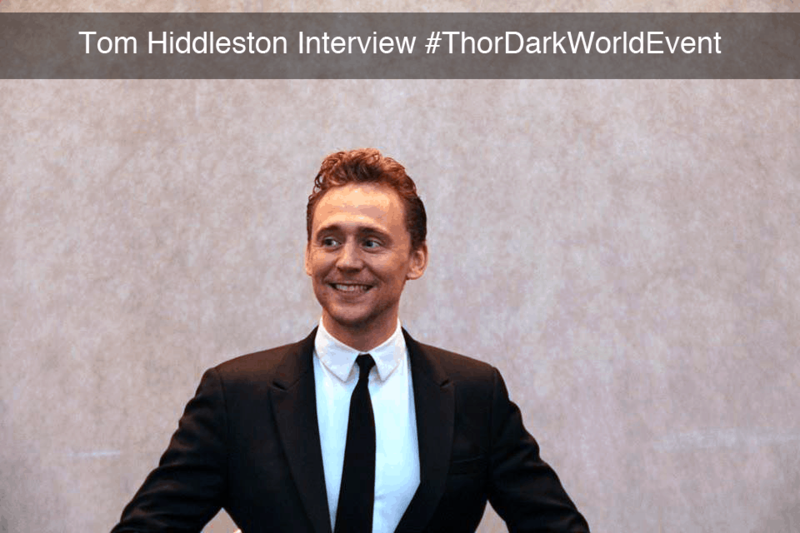 …Tom then ends his interview by doing Sean Connery and Christopher Walken for us ladies! It was really funny!